Brandon Wahl scored a game-high 20 points to lead the host Leopards past the Wildcats 69-52. Spencer Hall also tallied 8 and Derek Zeller added 7 for Louisville who improves to 10-3. Brandon Wahl scored a game-high 18 points to lead the Louisville to a 73-43 road victory at Canton South. Spencer Hall also scored 12 and both Davis Burick & Derek Zeller dropped in 10 each for the 8-2 Leopards. Elliot Tornow poured in a game-high 21 points and Michal Ball dropped home 13 points, but the Leopards fell in overtime to the Wildcats 42-40 as a game-winning three-pointer was waved off. Carson Davis poured in 20 points and the Leopards hit 9 three-pointers as a team in downing the visiting Canton South Wildcats 54-45 Monday. Blake Hoover led the Leopards with 18 points and Pavin Parks buried 5 three-pointers and scored 17 points during Louisville’s loss at Canton South Friday. Canton South closed the second quarter on a 12-0 run to pull ahead before defeating Louisville 50-35. Ronnie Carter led Louisville with 10 points, while Blake Hoover & Alex Schooley each poured in 8. Mike Kelly led the Leps with 18 points and hit 2 clutch free throws at the end of regulation to send the contest to overtime where the Leps won 43-41. The Louisville Leopards high school boys basketball team defeated the Canton South Wildcats 64-59 Tuesday night. Rocco Buccasso and Owen Gramoy each scored 17. 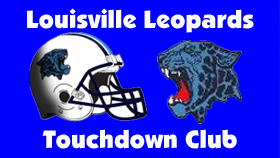 View video highlights on Leopard Nation!